Keeping your children entertained is a constant struggle. Accomplishing this without the help of television, phones, or other electronics is even harder. You encourage them to read, to go outside, and to explore the world around them, but that only ever seems to take 30 minutes, Suddenly, you’ve got a lot of time to fill, and nothing to fill it with. Sure, you could put in a movie, and you definitely have resorted to that, but you also know it’s time to add to your children’s activity repertoire. 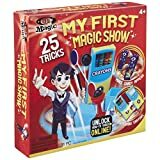 Believe it or not, kids magic tricks is a great place to start. Kids love magic. They get reeled in and mesmerized, and they don’t spend all of their time trying to figure out how it’s done. Kids also believe in it. They love watching it and learning it, which means each trick can hold hours of entertainment. We have kids magic tricks for you here. You can perform for them, and watch their eyes light up with wonder, and then you can help them learn how to pass that wonder onto other children. But first you need the right kids magic tricks. You need tricks that are mesmerizing and astounding, but also simple enough for your little ones to understand and recreate. You also need tricks that you can easily learn and perform. You’ve got a pretty busy schedule yourself, and you don’t have time to learn how to defy death or gravity, you just want to pull a few quarters out of a few ears and keep your kids happy when the weather is bad. 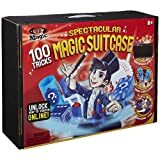 That is an easily attainable goal when you have these 20 kids magic tricks are your disposal. 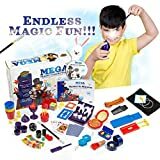 You can learn them, perform them, and teach them easily, and before you know it, you’ll have a troupe of miniature magicians who can delight in showing off their skills. You probably remember watching this trick as a kid. You couldn’t believe your own eyes. Your kids will feel exactly the same way, and all you need is a simple spoon from your kitchen drawer. To perform it, you simply hold a spoon with both of your hands around the handle. You then rest the bowl of the spoon, curved side down, on the table. Then press down on the bowl of the spoon as you allow the handle to slide inside of your closed hand until it reaches the bottom of your palm. From your kids’ vantage point, it will look as though the spoon is bending. This simple trick is easy to perform and easy to teach, although it will probably take your little ones some practice to make it look convincing. Once everyone is convinced the spoon is bent, you lift it up off the table in both hands, and reveal that it is actually straight. This rope trick is an easy and fun one that you’ve probably seen performed dozens of times. By placing an ordinary piece of rope in your hands, you say a few magic words, and presto change-o, a knot appears in the rope. Your kids will have as much fun watching this one as they will running around and performing it for everyone they meet. Plus, all you need is a length of rope. This trick is more science than trick, so not only can you teach your kids about the performance of it, you can also give them a miniature science lesson. All you need is a cup that isn’t see-through, a pitcher of water, and some sodium polyacrylate. These are moisture saving pellets that you can find at any hardware store, usually in the gardening department, or inside of a disposable diaper. The crystals absorb the water, which is what causes it to vanish. To being the trick, you’ll need to put about a tablespoon of sodium polyacrylate into your cup before anyone is watching. With the audience now watching, pour about a quarter cup of water from the pitcher into your cup. You’ll have to wait for the crystals to absorb the water to form a gel in the bottom of the cup. During this time you’ll have to give your kids a little song and dance about giving the magic time to work. Once the crystals have absorbed the water, you flip the cup over, and no water comes out. The water has vanished! To perfect this trick you’ll have to make sure that no one looks inside the cup at anytime during the trick. This one is part magic trick part out of body experience, but it will give your kids a neat little thrill. You probably remember doing it as a kid, and here is a great excuse to try it again. All anyone has to do is stand in a doorway and press their hands and forearms into the sides of the doorframe. The harder and longer they press the more effect it has, but don’t let your little ones over-do it. Try having them stand there for a minute. Once the time is up, have them turn to the side. Their arms will rise up as if pulled by an invisible string. This is a great kids magic trick to show and teach little kids because it’s super simple. All you have to do is hold the pencil at the tip of the eraser and shake it in just the right way. As it moves up and down it will appear, thanks to a nifty optical illusion, to bend. It might make it difficult for your kids to concentrate on their homework later, but at least you’ll keep them momentarily entertained. This is one of the great kids magic tricks because all it takes is a card, some clear tape, and a length of black thread, and your kids’ jaws will hit the floor. You can follow the tutorial here, and before you know it, you’ll be floating cards, spinning decks, and changing minds. Here’s another trick that involves more science than magic. All you need is a sharp pencil, and a Ziploc bag that’s about three-quarters full of water. You simply pierce the bag with the pencil until it goes all the way through from one side to the other. Somehow, thanks to science, the water doesn’t spill out of the bag. You can learn more about it here, and you and your kids can have fun exploring the reasons why too. This banana separating trick is fun and delicious. You present to your little audience a perfectly normal looking banana, and then you say a few magic words, perform a little ninja move, and then open the peel to reveal a sliced banana. Your kids will be impressed, and you’ll have a healthy snack ready to serve them. To perform the trick you just need to prep the banana ahead of time. All it takes is one ordinary banana and a pin. Insert the pin into the peel where you want the banana to separate, then rotate the pin from side to side until it slices through the banana. If you want to slice the banana in multiple places, just insert it and rotate it multiple times. Your little audience members won’t notice the tiny pinpricks, but they’ll think it’s pretty cool when the banana appears in pieces. Penetrating the impenetrable is such a cornerstone of magic, and it never ceases to impress people, especially kids. With this trick you just need to create enough distraction to pass the coin from one hand to the other, and then bam, it’s like it went right through the table. This helpful video can give you and your kids a few pointers. With just a little soap on your fingers, you can appear to separate water and pepper just by dipping your hands into the cup. To make the trick even more convincing you can also use a volunteer whose fingers do not make the water and pepper separate. Very clever and very easy. Perfect for a rainy afternoon that needs entertainment. Get the full directions here. Every good magician needs a few good card tricks to pull from, and this one is perfect for beginners. You pull 3 cards from deck of cards and allow one of your little audience members to choose one of the 3 cards. Then you shuffle the 3 cards back into the deck and reveal the correct card. If you’ve ever wanted to learn a little sleight of hand this is the perfect trick to start with, and your kids make the perfect gullible audience. Making things appear to levitate is some world-class magician level stuff, but with a ring and a rubber band, you too can achieve this astounding effect. You simply place a ring on a piece of string and pull the ends. The ring will rise up in the air to the wonderment of your children. How are you doing that? They’ll wonder. Well, the string isn’t a string. It’s a rubber band, and as you pull the rubber band it stretches and lifts the ring upward. It’s a pretty nifty little trick that your kids will get lots of mileage out of. This is another trick that will encourage your kids to play with their food more than eat it, but showing them how to crack an apple in half with your bare hands is not something they will soon forget. Plus, it might make lunchtime prep easier for you if you don’t have to reach for a nice to cut apples into manageable pieces. This one is a trick of force and leverage. You can watch the tutorial here, and start cracking apples of your own in no time. Before you tell your kids the secret to this trick they might actually think you’re a real life magician. No. More than a magician. When they watch you levitate a Styrofoam cup in mid-air they just might be convinced you’re some kind of a wizard. You might not want to relinquish that power, but when you’re ready you can show them that you’ve simply stuck your thumb through the foam and used a little stage diversion to keep them distracted from the truth. Find out more here. If your kids thought a floating cup was cool, then they’re going to love watching you levitate off the ground. You’ve probably seen this trick performed a million times and although you know it’s fake, you probably don’t know just how simple it is. All you have to do is stand on the tiptoes of the foot that is furthest from the view of your audience. Learn more about this simple trick here. This trick is just a little more advanced, and it’s great for older elementary kids who maybe weren’t impressed by the pencil through the bag of water. Although, come on, science is cool, right? At any rate, making it appear that you’ve punctured a hole through a precious dollar bill and then restoring it, is sure to make even a skeptical sixth grader smile. Here’s how you do it. All you need is a sugar cube, a pencil, and a glass of water for this simple trick. You ask your kids to think of a number, and then write that number on the sugar cube using a pencil. It has to be in pencil in order to work. You place your thumb on top of the cube, pressing hard enough to let the number transfer to your thumb. Then you ask for a volunteer. You drop the sugar cube into the cup of water and hold your little ones’ hand over the cup. By pressing your thumb into their palm, the number written on the cube ends up on the palm. Your kids will have lots of fun practicing the skill it takes to press the number into a palm undetected, which means you’ll get to volunteer a lot. This last trick is last because it could get messy. This little science experiment turned magic trick proves that eggs are pretty tough. In fact, they’re a lot tougher than you might think. When you try to break one in your hand by pressing all over, the pressure gest spread out, and the egg won’t crack. Challenge your kids (preferably over a sink) to see if they can crack a regular egg by squeezing it in their hands. You may all be surprised at the result. 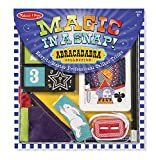 Once you work these kid’s magic tricks into your parenting routine, you’ll have kids that are astounded, mesmerized, and eager to learn. What’s even better is that they’ll be learning about patience, perseverance, and even a little science, and they won’t even know they’re learning anything other than how to have a little fun.